Just ordered some wheel rims, and tyres for my green slow 6mph BM2. I figured it will look pretty and doesent go very fast anyway so big rims, low profile tyres... Yes all opposite to whats needed. But I thought I would try it. Wheels are 10 inch diameter x 4j wide. Tyres are 130/60-10 and a bit cheap chinese and only temporary. These are also available in 4.5 wide. And a 145/50-10 tyre can be used, I may change my order. In both cases total diameter is 16.2 inches. So an inch bigger overall than the 3.50-8 tyres and the turf tyres on my other chairs. I feel sorry for you back! Take extra baclofen for the clonis! They will certainly look awesome though. They look nice and seem to have an offset which might work with the Invacare GB motors. Any chance of a link please? Well we will see. Mine are actually wider than the ones shown. But the main issue and reason for the slow chair is to make a chair with ridiculous range. That bolt pattern looks large, will an adapter be needed to fit it to the motors? 70 between bolts measured to next one. 130MM total width, 16 inch overall diameter inc tyre. Tubeless rim. The reason I choose that wheel is because it will be easy to make or order a 108mm round disk, with 4 holes... Then I can drill to suit the 3 hole off road, or 4 hole trailer, or the groove type hubs as I wish. And cover the centre at the same time. Ebay, or any monkey bike supplier worldwide. They are available in 8, 10, inch diameter, and 2.5 to 4.5 rim widths. If you want a non central offset you can order say a split rim wheel and centre, in DX in two widths and split them. Beware of valve hole though! And of course it wont be tubeless which rules it out for me. Ordered... Thermal protection for winter! Its a thermal mask. These are the wheels I was going to put on my M300. They look really nice and I'm sure would also look great polished. I would have to modify my shroud to fit the extra height. My concern is the overall chair width and fitting through my standard doors. I was thinking the double hinges may give me the extra space I need. What's your opinion of this? Building a BM3 just isn't in the cards for me right now with my health issues. What do you think about me using a smaller diameter of these wheels with a tubeless lawn tire? Pneumatic tires will give me a lot more comfort (I am not paralyzed and have tremendous pain levels) with increased absorption from bumps and uneven terrain. I have had a hard time finding a tubeless lawn tire with a 3.5" width. You wont find any narrow lawn tyres to fit an 8 inch diameter rim. You can use a 2.5 wide rim x 8 and fit any of the many 3.50 x 8 tyres, and only add 1 inch total width. Really its this or maybe a 2.75 to 3 inch wide rim, with a 110/80 x 8 tyre. That will still add 2 inches width to your chair. 120/70-8 tyre on an 8 inch rim that is 3.5 wide, results in a 4 inch wide tyre, with a huge sidewall, for a low pressure comfy ride. Results in a 15 inch diameter, less an inch at the bottom when you reduce the pressure. See the wider of these two. You need to find a 8 inch rim thats 3.5 wide however that is tubeless. I have not looked. There are off the shelf full opening door hinges. BM - have you replaced the rear light bulb with LEDs? Its not connected on 2 chairs, LED on a third. Wheels and tyres arrived. They are much nicer and shineier in real life than expected. Very pleased. And about 1 inch bigger than the 350x8 tyres, and 1.5 inches bigger than the turf tyres. Going to look really good. Will post pics once I get off this bed. The tyre profile or tread shape is very flat with a slight curve on a 4 inch wide rim. 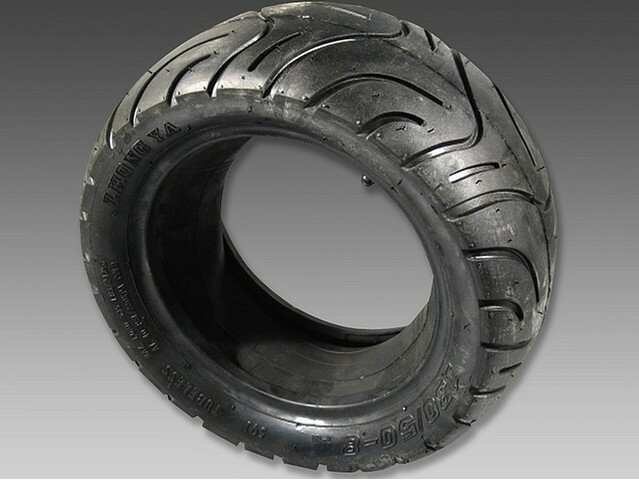 A cross between a motorbike tyre and a car tyre. And tubeless of course. rims are 4. Tyres are 130/60 but may try a set of 130/70 or the 145/50 depending on how they look when fitted. The tyre in that picture above is narrower and taller and not inflated. These lookmuch better. Nice 1. Get them pics up. Bet they look mint. Are you sticking with p/g 100amp PM. running f55 4 pole motors as before. As you said with Lithium 24v. Going for long range setup more than speed on this build !!. Tyres are these. Flat shape suitable for chair. yes 6mph and 100A electrics, 120Ah lithium, but will be nearer 7mph with these 16 inch tyres. Its just a freshen up rebuild. Those look nice and I don't think the ride will be as harsh as I first thought. More sidewall there than first glance. It'll still be better than any solid tire on any stock powerchair. What about rear suspension? Wouldn't help with the spasm and clonis inducing vibrations, but could take the back jarring sting out of sharp edges. Send me some dimensions and I'd be happy to whittle something out of aluminum or good chromoly and send it across the pond to you. I've already thought of a design for my next build (whenever that may be) that'll give 3-4" of REAL suspension travel and add basically zero width to the chair. I can see a set of those on one of my chairs . John, how wide do you think will "Greenie" be with those? Hi BM, just curious to ask why you want a 24V BM2 again, when you have huge success in BM3 @ 42V . Because its just a quick and easy rebuild/repair/refresh of a BM2. For a spare chair. Same everything as before other than rims and colour, and replace the hopeless lead bricks with lithium and new bearings, bolts, rose joints, same EMD motors since I already have a new set and they just bolt on, upholstery etc. But yes 6mph is slow! But it wont cost much. Take some pics, test, throw a sheet over it and park next to the fridge! My next lithium roboteq BM4(X4) chair will be 4x4 skid steer since theres enough power and battery to make it actually work! 4 physically smaller 2 pole motors, 36V, 100Ah usable, 6mph motors at 9.5 mph to guarantee good torque etc. It wont do carpets much good but it will allow decent skid steer control and range for the first time ever in a small indoor usable powerchair. And all wheel suspension. Probably with 4x 145/50-8 tyres like this, on over wide 4.5j rims. Here its over inflated. At 15psi they sit much more square profile than this. Ignore lower tyre. Its a "front" tyre and a different size. These are 14 inch diameter almost. And wide with a slight curved profile at low pressures, so have a low surface loading for the soft stuff, and so should slide sideways easily too on carpets and other surfaces with little effort compared to tall, treaded, normal profile tyres. And because of low profile, wide rim, no sidewal shuffle when zero turning. And tubeless, despite showing a tube here! Will you recommend the most close tyre in metric in respect of 3.50-8. ? I want to go tubeless too .